“Three gunmen, who have been hired to assassinate the President, hold a family hostage while waiting for their target. Interesting B film which focuses on psychopathic killer well-portrayed against type by Frank Sinatra.” – noir expert Spencer Selby. 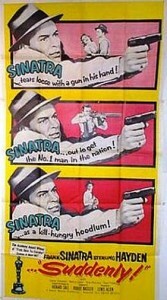 Cast: Frank Sinatra, Sterling Hayden, James Gleason, Nancy Gates. 77 min. Is an American film noir directed by Lewis Allen with a screenplay written by Richard Sale. The drama features Frank Sinatra, Sterling Hayden, James Gleason and Nancy Gates, among others. The tranquility of a small town is jarred when the U.S. President is scheduled to pass through and a hired assassin takes over the Benson home as a perfect location to ambush the president. In post-war America, the President of the United States is scheduled to journey through the small town of Suddenly, California. Claiming to be checking up on security prior to his arrival, a group of FBI agents arrive at the home of the Bensons, on top of a hill that looks down upon the station where the Presidential train is due to stop. 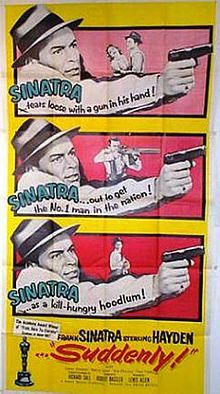 However, they soon turn out to be assassins led by the ruthless John Baron (Frank Sinatra), who take over the house and hold the family hostage. Sheriff Tod Shaw (Sterling Hayden) arrives with Dan Carney (Willis Bouchey), aSecret Service agent in charge of the President’s security detail. When he does, Baron and his gangsters shoot Carney and a bullet fractures Shaw’s arm. Baron is confronted by the sheriff on the risks and meaning of killing the President and Baron’s remaining henchman begins showing some reluctance. For Baron, however, these are the very least of his concerns and it soon becomes clear that he is a psychopath whose pleasure comes from killing – who and why he kills being the least of his problems.